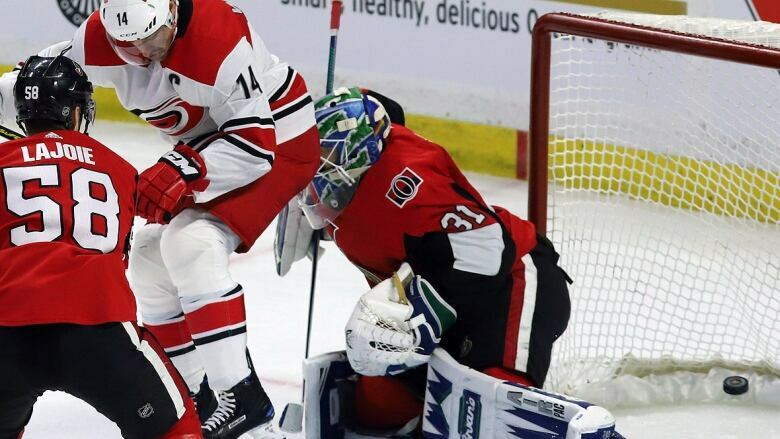 Justin Faulk and Brock McGinn each had a goal and an assist as the Carolina Hurricanes won their fourth straight game, downing the hometown Ottawa Senators 5-4 on Sunday. Despite giving up two goals eight seconds apart in the final minute of the second period to tie the game, the Carolina Hurricanes seemed to have no issues with a letdown in the third period on Sunday afternoon. Justin Williams scored the winning goal and broke a 4-4 tie with a power-play goal at 7:34 of the third as the Hurricanes defeated the Ottawa Senators 5-4. One minute later, Williams nearly scored again but he was robbed with a great glove save from Andres Nilsson, who came on in relief of Senators starter Marcus Hogberg in the second period. Justin Faulk and Brock McGinn each had a goal and an assist as Carolina won its fourth straight game. Jaccob Slavin and Dougie Hamilton also scored for the Hurricanes (19-17-5), who got a 27-save performance from Petr Mrazek. "It was surprisingly easy to [mentally] park [the end of the second period]. I know you'll probably look at me and roll your eyes, but good teams pick each other up," Williams said. "Mrazek came in and said 'that was on me' and we instantly said 'No, no, no. You've had our back all the time, so it's time for us to pick you up', and that's what teams do, they pick each other up. They don't let someone stew about it and we had a great third period and won the game." Just eight seconds earlier in the second period Rudolfs Balcers scored his first NHL goal in his second career game as the Senators (15-23-5) saw their losing skid stretch to eight games. Matt Duchene and Ryan Dzingel also scored. "Right off the bat I tried to get myself in the game. I take pride in playing for the Sens and playing this game at hone after everything I've gone through since the first day of camp. It means a lot to me." The Hurricanes had a ferocious start, scoring on two of their first three shots less than five minutes into the game.